Home 2018 Bathroom Trends	Tricks to Help Your Bathroom Sell Your House! 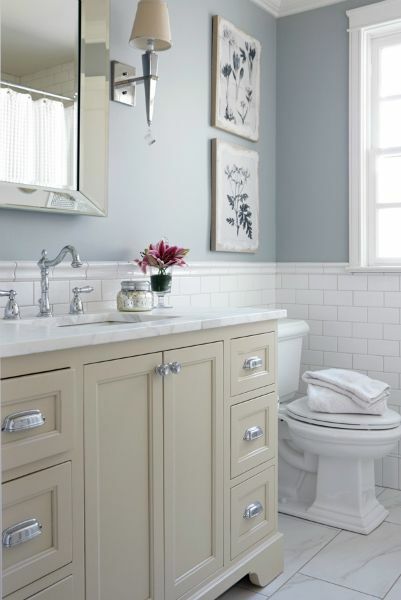 Tricks to Help Your Bathroom Sell Your House! When it comes to the resale value of a home, renovating your bathroom is one of the most important investments you can make. But there’s another, perhaps ultimately more beneficial, reason to consider a bathroom makeover. Nothing lifts your spirit like starting your day in a room you love. Whether you’ve hired a design team or not, it’s really important to know what you like and dislike about your space. Most of us live in tract homes so re arranging the footprint of a bathroom isn’t financial feasible or smart. But there are some things you can do without the cost of re plumbing and a total tear out. Make a wishlist of what you most like googling images on Pintrest and Instagram. They can be fantastic sources of inspiration. The more you are really aware of what you love, the easier it will be to make decisions as you move along. It will also give you a solid database to use and compare against your selections. From there, you can think about aesthetics, from the color palette to the types of fittings you’d like to incorporate. They do add up from cover plates to towel bars. Make a Budget…then add 5% conservatively for all the unknowns. Changing out your cabinets and sinks can make a huge impact and return on investment. Our if you don’t have it in your budget…paint. Checkout my previous blog posts on the benefits and savings with paint. But a warning, just slapping a coat of paint on worn cabinets will do nothing to improve your home value or the aesthetics of your bathroom. Tips on Painting your Cabinets Right! Just a simple coat of paint can not only give your bathroom a new clean look but also help in the value of your home…so choose wisely getting sample paints before you go for it. Look at the color on your walls at different times of the day and how it effects your skin tones… and your mood. The materials for the average typical bathroom remodel will cost between $8,000 and$10,000. This includes new fixtures like a new toilet, new sink, and a new bathtub. It also includes the cost of new tiling, new cupboards, and a counter top for the sink. Wouldn’t you love to have this bathroom? Well we can dream right!! 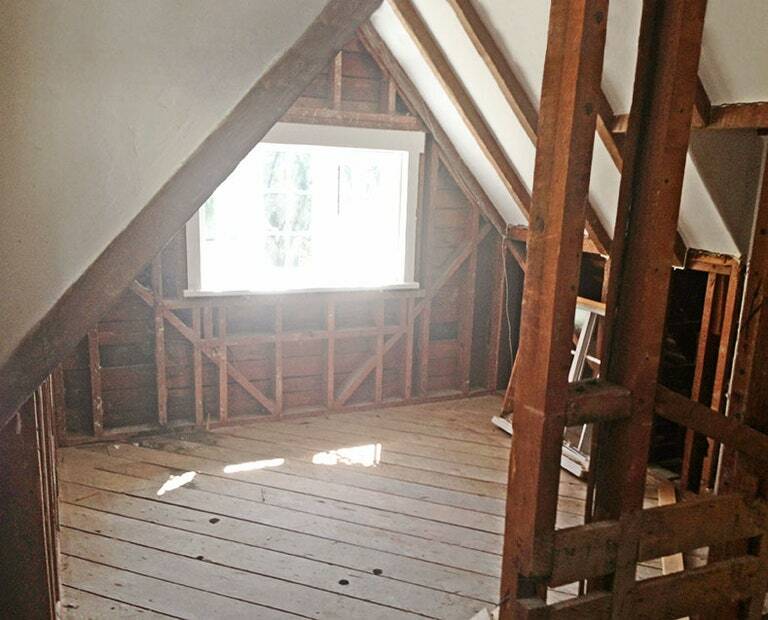 Isn’t it fun to see what was once an attic space being turned into this dream bathroom!! If you are doing a complete renovation you can hire a pro for this all-important demolition phase, which will set you back about $1,000. Or, by tackling some or all of the teardown yourself, you’ll have more money to spend on something you really want. Lightly used and recycled fixtures and building materials cost a fraction of what you’d pay for new at the neighborhood home center. At well-known national resources such as Diggers List and Habitat for Humanity Restore Resale Outlets, you’ll find everything from tubs, faucets, and tile to double-hung windows and laminate flooring. Consider using subway tile for your tiled surfaces. Clean, simple and less than $3 per square foot, classic subway tile has a timeless appeal that harmonizes with nearly every décor. Even the least expensive tile can eat up your design budget. 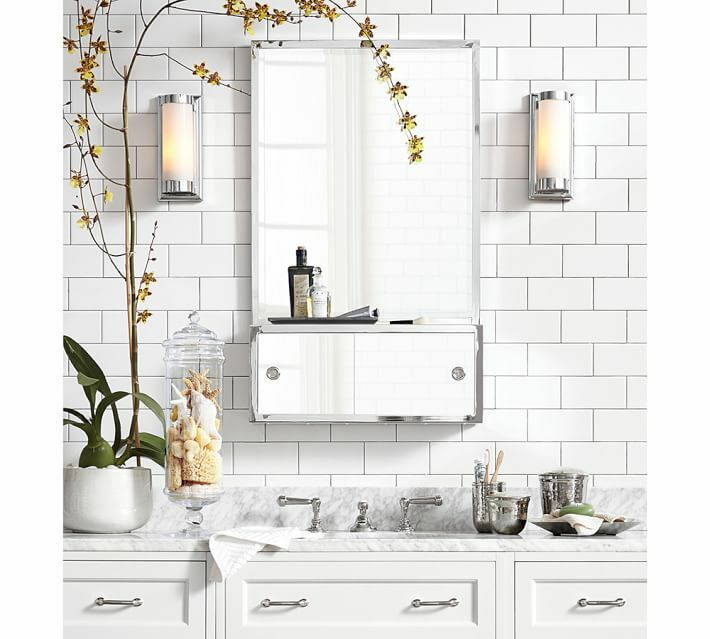 But you don’t need floor-to-ceiling tile to make a dramatic impact in your new bath. You can save a chunk of change by limiting tile to the floor and shower and painting the walls. For added warmth and texture, add an inexpensive and easy-to-install wainscot of faux beadboard. Now with all that said what is the very minimum you can do? 1. Clear off the counters to create a blank canvas. Remove all of your everyday toiletries and bathroom supplies. This includes soaps, toothbrushes, cotton balls — everything. (And don’t forget the products in the shower.) Buyers do not want to see your personal hygiene products. In fact, this can make them feel as though they are intruding on your personal space, which can be distracting and a little awkward. Unify artwork by common features; color, frames, matt colors, and so on. In this picture, all the photos are all black and white, for instance. 2. Get rid of cleaning products. Remove all items that imply housework and maintenance, such as toilet brushes, wastepaper baskets, sponges, cleaning products, bath mats — even spare toilet rolls. These are a necessary part of everyday living, but they do not create a beautiful spa-like experience for your buyers. Tip: Remove the bathroom scale, too. Remember, your buyers want a luxurious bathroom experience, not a reminder of those extra pounds they are trying to lose. 3. Maximize your storage. Storage space sells. 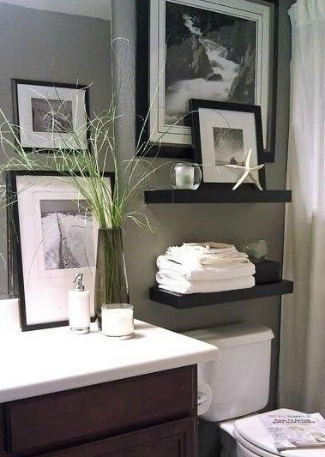 Your buyers will be looking inside your bathroom cupboards to see how much space they offer. Make sure they are only half to two-thirds full and well organized. Store the little things you use every day (hair elastics, lip gloss) in a pretty box or basket with a lid to avoid a tidal wave of trinkets on the shelves. 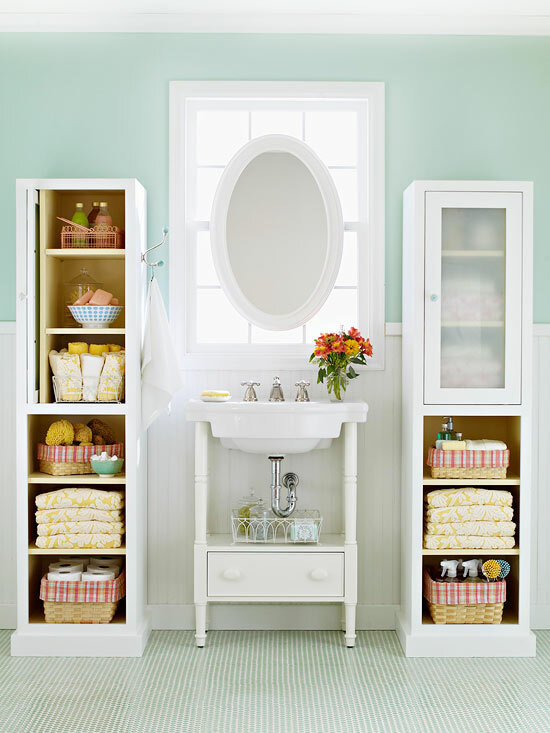 Tip: If you’re running out of space to store your toiletries, keep the overflow in simple wicker baskets. When buyers are coming to inspect your home, just grab the baskets and stash them somewhere else. 4. Clean thoroughly. Clean everything to within an inch of its life. No, it’s certainly not exciting, but it’s super important. Buyers will pay a premium for new, so your aim is to create a new feel. Everything must be immaculate, as this creates the impression that your home has been well maintained and well loved. Next Blog Post…do have a bathroom doorway without a door? 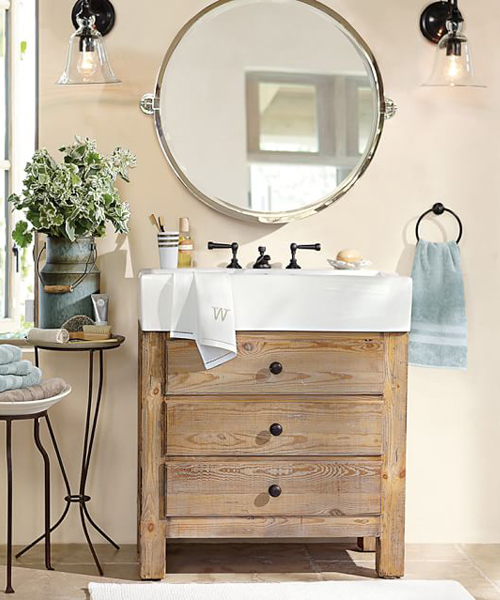 Yep…Next blog post..will a Barn door work for your Bathroom? Barn Doors for your Bathroom En Suite Entrance!